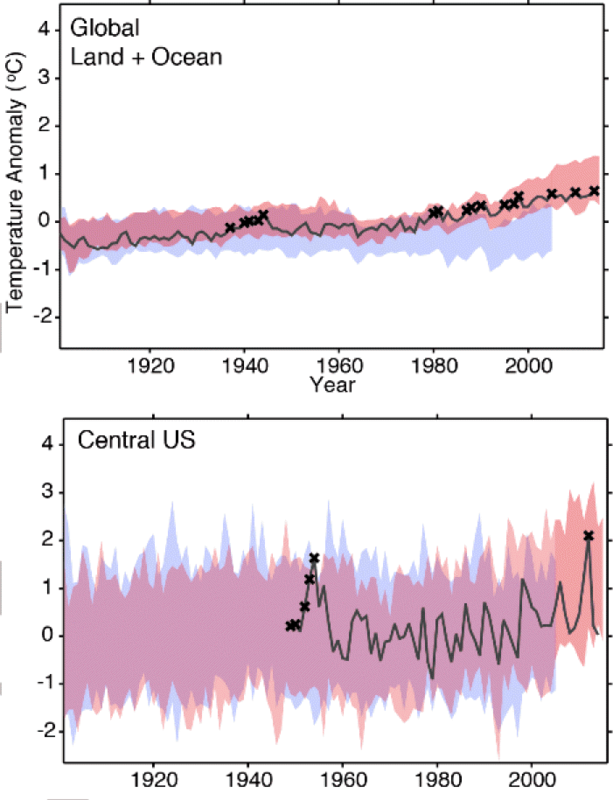 Below are charts showing the hot years (marked with an X) that would be unlikely to have been as hot except for human-induced warming. As always, click the charts to see them more clearly. With regard to the earlier years in the list in the 1930s and early 1940s, the authors wrote that as well as a detectable human influence, these may have also been partly influenced by warm phases of the Atlantic Multidecadal Oscillation (AMO) and the Interdecadal Pacific Oscillation (IPO). Windows of 21 years were chosen as the use of shorter periods would reduce sample sizes and the use of longer periods would lead to larger changes in the anthropogenic forcing between the start and end of the windowed period. What I think they are saying is that the world is warming so quickly, that using windows larger than 21 years means the disparity between the start and end years is big. So if the probability of an event occurring naturally is one in a thousand or 0.001 and the probability that it occurs with human activity =0.99, then FAR = 1-0.001/0.99 or 1-0.001, which is 1.0. If a similar event took place recently, then it would be attributed almost solely to human activity. If FAR is 1, then it is getting close to impossible for the event to have occurred without the extra greenhouse gases. If FAR is zero, then the event could happen with or without any human-induced forcing. If FAR = 0.5 then the chance of a weather event occurring is doubled with AGW. The FAR technique is one in which observations are compared with climate models, using natural only as well as human forcings. That way, scientists can compare what would have happened with only natural forcings, with what would happen with anthropogenic forcings, and with what happened in reality. The scientists chose models that "have at least three historical simulations, one historicalNat simulation and one RCP8.5 simulation available for analysis". They then regridded them onto a common 2x2 grid (except for the CET and global series) and masked them before area averaging, as shown in Figure 1 above. the 21-year moving natural- and all-forcings ensembles associated with each year were bootstrapped (with replacement) 10000 times on 50% sub-samples of complete model simulations. These 10000 bootstrapped estimates were used to calculate 10th and 90th percentile FAR estimates. A significant anthropogenic influence is detected if the 10th percentile FAR value is greater than zero (i.e. 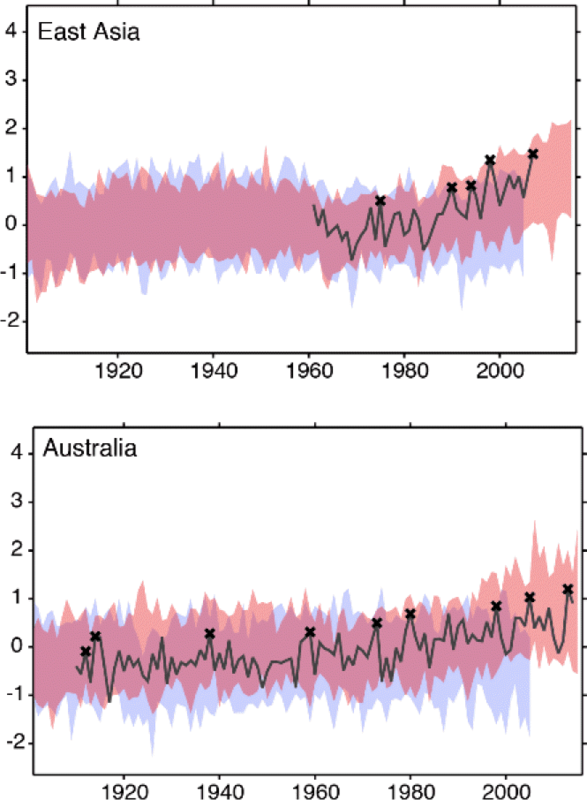 human-induced climate change has very likely increased the likelihood of record-breaking hot events). A significant and substantial anthropogenic influence is detected if the 10th percentile FAR is greater than 0.5 (i.e. human-induced climate change has very likely at least doubled the likelihood of record-breaking hot events). Similarly, anthropogenic influences can be said to have significantly reduced the likelihood of hot events if the 90th percentile FAR is below zero.This happens in the mid-20th century in Central Europe and East Asia due to the effect of anthropogenic aerosols. I couldn't find anything in the paper or the press release about heat waves being from 2 to 10 times more common after 2000. I've no idea where Anthony got that from. The paper wasn't even about heat waves. It was about record hot years. If anyone can find where the paper or press release discusses this, do let us know. In short, the entire study is an attempt to pull a desired result out of a set of data. Reading the paper, it seems clear to me that the conclusion existed before the paper was written. Here is the press release for what it’s worth. No, it doesn't. It's Anthony Watts who cherry-picked data to try to tell his readers that the USA isn't getting mighty warm. The conspiracy theorists were out in force, as you'd expect, with comments about climate science being a hoax and scientists committing fraud. WUWT is a climate conspiracy blog after all. Rather than inform people about climate science, Anthony Watts promotes Velikovskyism "in the context of learning". I didn't see a single comment from anyone who gave the slightest sign of accepting science. His blog is virtually 100% for climate conspiracy wackos. Mycroft thinks it's been too hot to get any sleep. He's not far wrong. Jesus! How do these clowns sleep at night? They truly believe they are saving humanity from itself. Since most of them are far left cretins, they naturally use Alinsky’s framework as the means to attain their goals, subjugation of the human race to an elitist ruling class (them). Are they using raw or corrected records from the 1930’s? 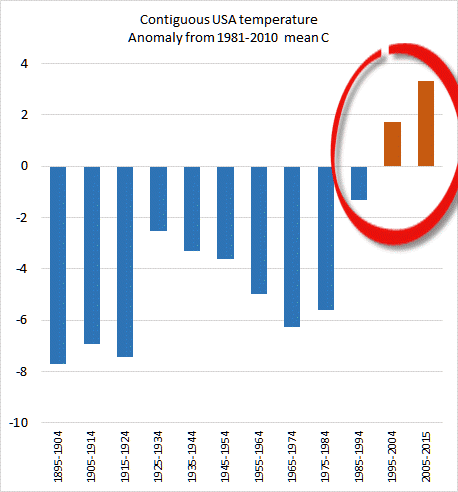 As various reports of what the raw records were from the 1930’s, at least in the US, it was warmer then than in the 2000’s. We tortured the data until it confessed! But of course they got their main aim – unquestioned parroting of their press release in the Fairfax papers across Australia and no doubt similar newspapers across the world. Conveniently, the data set reaches ALLLL the way back to 1895 and the 2000’s is just plain unusual. Has anyone asked the aerosols whether they also work at 33,000 ft? I’ve seen dark smoke hang over cities – I’ve never seen it at cruising altitude. Can’t see how it would affect the satellite readings. They don’t have a clue about “natural” climate drivers, but claim to have considered them all? 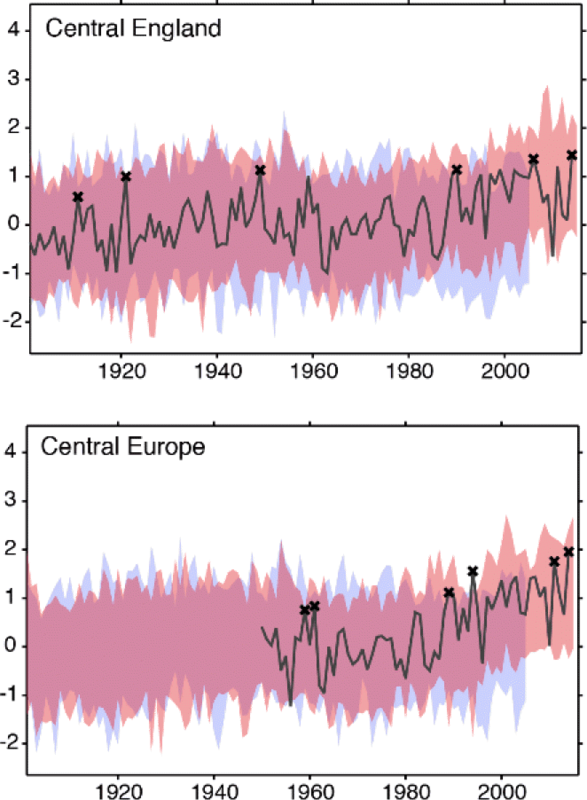 When did I miss the trove of papers describing the climate drivers that created the Minoan Warm Period and the subsequent cold period, the Roman Warm Period and the Dark Ages Cold Period, the Medieval Warm Period and the Little Ice Age? I think any paper claiming to have “…examined weather events that exceeded the range of natural variability…” needs to first be able to fully explain the previous natural variability. These are the fundamental problems with the hypothesis of human-induced global warming. As a result, the climate science community still can’t realistically differentiate between natural and manmade global warming. You mean humans had an impact on the climate back in the 1930? Phew! I thought it was all my fault. They are claiming that we would have had a lot more man made warming, have it not been for the man made cooling. Had they just come back from the bar when they wrote this.? Bellprat, O., and F. Doblas-Reyes (2016), Unreliable climate simulations overestimate attributable risk of extreme weather and climate events, Geophys. Res. Lett., 43, doi:10.1002/2015GL067189. "Record-breaking years... that may be attributed to anthropogenic climate change are marked with black crosses"
I would argue that there are more years that may be "attributed" to anthropogenic climate change than just the "record-breaking" ones marked with black crosses in figure 1, but because they occur subsequent to a "record-breaking" year they are ignored under the definition. It would be interesting to see the figure redrawn with all anthropogenically-influenced years included. Guess what that line would look like...? The Christy graph in figure 2 above is amusing in its own torturing of the data... It claims to be centred on a 0 value, and yet the residuals arounds that purported zero are heavily weighted in the negative. I should have been clearer. 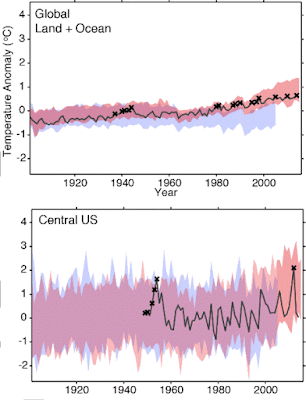 Figure 2 is from NOAA data which I plotted as decadal averages. John Christy's chart at WUWT was a different one. It was showing something about weather stations that showed 100F or more temperatures. I incorrectly wrote how it was from the C20 average. I thought it looked odd and should have done the sums, but forgot. It doesn't say on the website what the baseline is, but a quick check shows the anomaly is from the 1981-2010 average. I've fixed the chart label to show that. Heh, the Spanish Inquisition will be knocking on your door Sou - to offer you a job! Just the sort of thing "an emotionally based lifeform" would do!!! "a chart from John Christy ... stations"
So, at WUWT, acceptance of this data depends on who is using it. That's a suspiciously useless metric. Why 100 degF as the threshold? 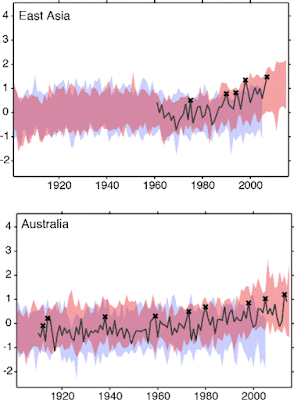 Different places have different climatologies. If the number of stations happens to increase more in colder areas, the average number of 100+ degF days will decrease, even if the entire country is warming. "That's a suspiciously useless metric. Why 100 degF as the threshold?" I've noticed that Steve Goddard often does the same thing. But I can't believe Christy would be stealing ideas from Goddard. Christy has a long track record of irrelevant, uncorrected, or simply misplotted graphs from which he argues that climate change isn't happening. Graphing 100F as an arbitrary threshold, rather than the changes in temperature anomaly, if just more of the same. Will this shadow cool the Earth? Just asking! "Will this shadow cool the Earth? Just asking! Can't tell if you are kidding, but yes, scientists do use eclipse events to estimate climate forcing responses. The amount of sunlight eclipsed is a known quantity so they can try to characterize what is called the impulse response function. A negative impulse in this case. @what I was kidding. It was an attempt at a lame joke at the expense of deniers who always come up with things that real scientists do try to account for and the deniers in their ignorance think they have had an original thought. that Antarctic story had star billing in the recent video Potholer54 did regarding "why Temperatures never go up in straight lines"